Trump's Plan To 'Make Mexico Pay' For The Wall Trump demands that Mexico pay up to $10 billion or risk the cutting off of wire transfers from the U.S. to Mexico and a cancellation of business and tourist visas for Mexican citizens. 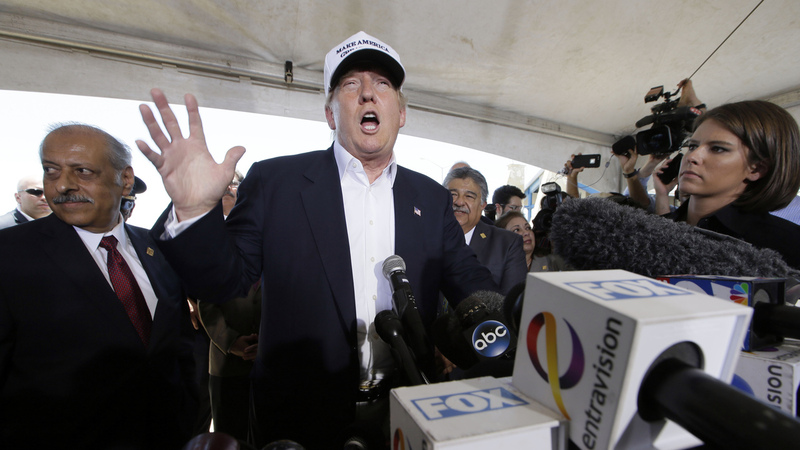 Donald Trump speaks at a news conference during a trip to the U.S.-Mexico border in Laredo, Texas, in July 2015. But now comes a bit more detail — in a memo just over a page long — first reported by the Washington Post and now posted on the official Trump campaign website. It's still all about leverage. The memo lays out a three-day plan, using provisions of the Patriot Act, that Trump says will "compel Mexico to pay for the wall." Day 1: The Trump administration would draw up a "proposed rule" stating that no one be allowed to wire money outside the U.S. "unless the alien first provides a document establishing his lawful presence in the United States." Day 3: Tell Mexico that if it agrees to come up with the cash to pay for the wall, then the "proposed rule" will never go into effect. Further, Trump says the U.S. can use tariffs and strict enforcement of existing trade rules. The memo maintains that any price increases Americans see as a result of such policies would be "more than offset by the economic and income gains of increased production in the United States." In addition to that, there would be the cancellation of visas for Mexican citizens coming into the U.S., including business and tourist visas. In short, pay up or risk an all-out trade war with the U.S., writing new punitive measures that Trump says Mexico couldn't bear. President Obama dismissed Trump's plan as politics and "half-baked." He called his plan to halt remittances "impractical" and said that the U.S. wasn't going to track every Western Union package. "We've got serious problems here," Obama said from the White House Briefing Room. "We've got big issues around the world." Mexico is an ally, which the memo asserts in its conclusion "has taken advantage of us in another way as well: gangs, drug traffickers and cartels have freely exploited our open borders and committed vast numbers of crimes inside the United States. The United States has borne the extraordinary daily cost of this criminal activity." It closes by saying the U.S. has the moral high ground, and it's time "we use it to Make America Great Again." So far, there's been no official reaction from the Mexican government to all of this, but in the past there have been strong statements in opposition to Trump's calls for the country to pay for a wall. Last month, President Enrique Pena Nieto told the Excelsior newspaper that there is no scenario under which Mexico would do that. At the time, he also stressed the importance of the long-standing alliance and friendship between the two nations and said Mexico will work with the next U.S. president to continue that. That followed even stronger language from former Mexican President Vicente Fox in an interview with U.S.-based Univision. Fox responded with a vulgar exclamation when asked about Trump's demand, stressing Mexico will not "pay for that [expletive] wall." He went on to call Trump a "crazy guy," adding that the billionaire candidate "should pay for it. He's got the money." That was back in February, and, at the time, Trump responded during a GOP debate on CNN, saying, "The wall just got 10 feet taller, believe me. It just got 10 feet taller."